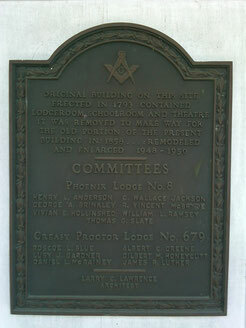 Having survived the Civil War and the Great Depression, and lasted 90 years, the Lodge was ready for renovations by 1949. We know from our records that funds were raised among the Brethren and two new wings were added to the building. These additions were built on new brick foundations extending to the North and South of the original foundation. In the early part of the 20th century, electricity was introduced to the Lodge, but the Lodge was still heated by wood-fired fireplaces and stoves. It is said that some eary members paid their annual dues in the form of firewood. 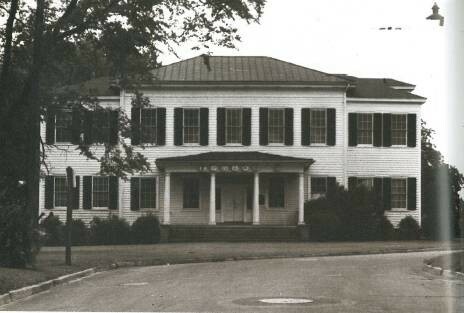 The renovations completed between 1949 and 1950 included a kitchen, two bathrooms, a coaching room, and a utility room on the first floor. A stairway was constructed leading to the second story, where a new bathroom, an ante-room, and a preparation room were built on the North end of the building. In the South, the stage area in the symbolic "East" was expanded, and a large storage room was built to store Lodge supplies and furniture. The structure of the Lodge was strengthened by steel beams stabilizing the walls and supporting the second floor. The Lodge room itself underwent major cosmetic renovations, including the columns and other architectural edifices that we now enjoy. In the late 1960s, two air conditioning units were installed for the comfort of the Brethren. These were rebuilt in 1988 and 1989, and repaired periodically after that. In 1977, General Electric duct furnaces were installed to heat the second story, and in 1981 an overhead gas blower unit was installed to heat the first story. In the 1970s, the coaching room on the first floor was dedicated as an Archives Room, and this beautiful room now houses many historical items and the Lodge's library. New seats were installed in the Lodge in the early 1980s, funded largely through donations from members and their families. A major improvement to the Lodge building was made in the 1980s with the installation of an electric elevator. This has been a great benefit to the members and guests. Much effort and expense was put into repairs and upgrades during 2011, including replacing rotted support beams and adding many security enhancements to protect the integrity of the building. Also, the air conditioning units required extensive repairs after being vandalized. In 2012, the Lodge continued making major renovations, including replacing the old asphalt shingle-over-steel roof with a new standing-seam steel roof. This new roof should protect the Lodge for at least 45 years. The old Elm tree that stood in the front yard of the Lodge for many years had to be taken down in December 2012 as it had become severely decayed and was a safety hazard. Many cosmetic upgrades were completed between 2012 and 2013, including repainting the Lodge room, reclaiming and repainting the first floor hallway, and consolidating our Past Master photographs onto one wall. In January 2013 renovation of the kitchen began in earnest, being completed in February 2013. The kitchen required extensive repairs, including new floor, new cabinets, and new drywall. The doorway between the kitchen and the dining room was also expanded to allow easy passage between the two rooms. Come see how great it looks!